Boddingtons Detectamesh detectable underground warning tapes are a coloured plastic detectable mesh netting for cable marking and detecting buried underground pipes, cables and utility service lines. Boddingtons warning tapes covers can be used in conjunction with cable and pipe locators or cable avoidance tools for the location of underground cables and lines. Detectamesh detectable mesh is manufactured from high strength coloured rot resistant homopolymer polypropylene plastic mesh incorporating a traceable stainless steel wire or aluminium foil strip, and overprinted with a warning message in black. Available in a range of colours including blue, green, red and yellow. The warning message can be printed to suit the users requirement subject to minimum order quantities. Texts can be printed for gas lines, electrical cables, water lines, sewer lines and fiber optic cable lines or pipes offering cable protection for a range of different applications. Pictured: Detectamesh Detectable Mesh – protection of underground water mains pipes. It is recommended that the detectable mesh be buried halfway between the buried service and the surface of the earth. Unroll the Detectamesh onto the backfill in the trench ensuring that it is earthed at both ends. Join the wires of rolls or cut lengths using Boddingtons crimps. Backfill the trench further to the surface. The mesh can easily be detected down to one metre. Please consult T&D for further details of the exact depth your equipment can locate to. It is essential that all joints in the Detectamesh are completed using Boddingtons joining crimps to enable a strong corrosion resistant connection. The crimping tool has serrated jaws to ensure a good connection and prolonged security. If the mesh wire is not connected correctly then the signal may not pass from roll to roll. 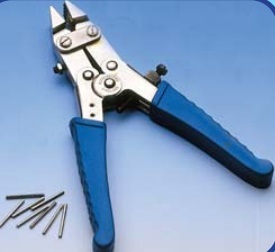 To ensure a continuous signal along the mesh it is important to use Boddingtons wire crimps and crimping tool. This gives the join sufficient strength to cope with most back fills. If it is not installed correctly then the signal may not pass from join to join.